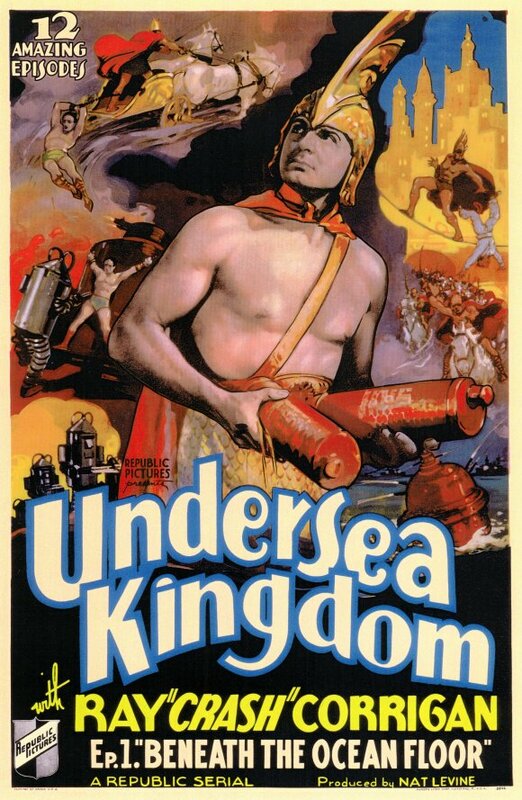 Undersea Kingdom (1936) is a Republic Pictures film serial released in response to Universal’s Flash Gordon. It was the second of the sixty-six serials made by Republic. In 1966 scenes from the serial were edited into a 100-minute television film titled Sharad of Atlantis. The star of the serial is Ray “Crash” Corrigan, using that screen name for the first time. The name was created to sound similar to “Flash Gordon”, in one of many similarities. Formerly a stunt man — he was the person swinging on vines in Tarzan the Ape Man — Corrigan went on to use this screenname for the rest of his career in serials and B-Westerns. The plot revolves around the main character “Crash” Corrigan trying to stop an evil tyrant ruler of Atlantis from conquering the lost continent and then the entire upper world. Lieutenant Crash Corrigan, in his last year at Annapolis, is invited by Billy Norton to visit his father, Professor Norton, after a wrestling match. At their house, the professor is demonstrating his new invention, which can detect and prevent (at short range) earthquakes, to Diana Compton and his theory about regular tremours from the area where Atlantis used to be. When Atlantean tyrant Unga Khan and his Black Robe army turn their Disintegrator beam on St Clair, Professor Norton leads an expedition to investigate. Along with him in his Rocket Submarine are Crash, Diana, three sailors (Briny Deep, Salty, Joe) and their pet parrot Sinbad. Unknown to the expedition until it is underway and in trouble, Billy has stowed away on the Rocket Sub as well. Problems for the expedition begin when Joe, in charge of the engine room, is driven mad by the fear that the submarine cannot survive such depths. In order to prove this, he locks the engine room door and sends the sub into a fatal dive. As soon as this crisis is averted, Unga Khan and Captain Hakur detect their approach and bring them through a tunnel into the Inland Sea with a Magnetic Ray.